We keep saying the "Advent of Decay" series is all about women and twinks, but so far have only reviewed women. Here comes some parity! An ancient Wood Elf of the First Age, Lord Aristaeus Aydon serves as the stern and wise advisor to Queen Artemyss Silverchord. When Artemyss was orphaned in her formative years, it was her uncle Aristaeus that stepped up to fulfill the role of surrogate parent. Although his disposition is icy and his teachings are strict, Lord Aydon's love for Artemyss is revealed by the fiery manner in which he protects his Queen and her beloved people. Well that's nice! This Elrond-lookin' guy is actually a little bit personable, rather than being an unrelenting grumpopotomus like the real one. At least, the way Agent Smith played him in the movies - I can't claim to have ever read the books, so maybe he's actually pleasant to be around there, rather than his every stage direction being "scowl more! Be more disapproving of everyone and everything!" He was kind of nice to his daughter, but only as long as she was doing what he wanted, and had no patience for anyone else. Maybe that's what getting screwed over by Isildur will do to ya (as long as you're willing to hold a grudge for 3,000-plus years). The face definitely looks Elrondish - those thick cheekbones, those imperious eyebrows, etc. 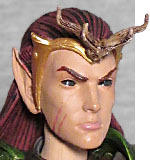 There are only so many ways to do an elf lord, honestly, and it's not like the Horsemen were trying to make the figure look like Hugo Weaving, it just happened. His crown has tiny antlers on the forehead, fitting his allegience, and two scars on the right side of his jaw - battle elf! The head ends up looking slightly too large for the body, because the torso is so very skinny. 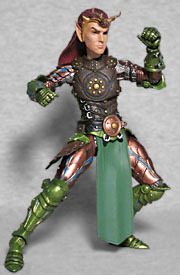 It's got a fantastic sculpt, with a pattern that looks like something a wood elf would wear. 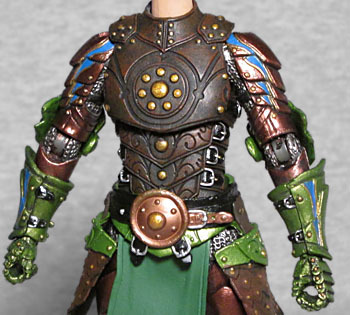 The armor over the stomach is strapped on, and the chest plate seems to have rivets. There's a circular symbol on the center of the chest, which could either represent the sun (fitting with the nature theme) or maybe seats around the table of some ruling council. 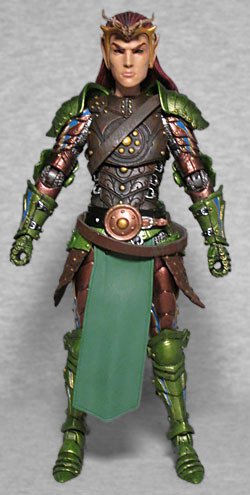 The layered armor panels on the arms and legs are similar to those in the first series, just thinner. There's scale mail hanging over his hips, and a long green loincloth reaching all the way down to his shins. Putting on the alternate shoulder pads helps the body look more coherent, easing the transition from head to torso. Like all the Mythic Legions: Advent of Decay figures, Lord Aydon gets a balljointed head and torso; swivel/hinge shoulders, elbows, wrists, hips, knees, and feet; and a swivel waist, forearms, and ankles. His long hair does rather restrict the head, and when you try to move the legs to the outside, the pegs want to pop out of the hips more easily than the joints want to move. The pauldrons mount on swivels in the shoulder blades, and the skirts are all soft enough PVC to flex out of the way when he moves. The original plan was for Lord Aydon to only come with two swords of varying size, as well as the shoulder armor and a couple of straps. But when the Kickstarter reached $615,000, more weapons were unlocked for him. 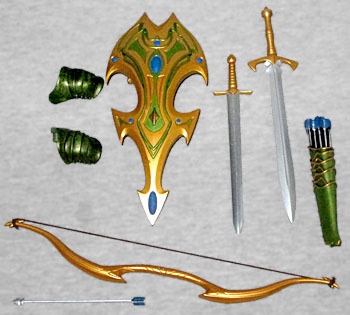 Thanks to the public's generosity, Aydon also comes with the Longbow, Quiver & Shield from Elf Weapon pack. We've seen the quiver (and the loose arrow) already, but the bow and the shield are new. The bow is actually taller than the guy who will be using it, and the shield has a weird shape with a raised pattern on the front and a removable handle in the back. Aydon may have the name of a hipster's boychild and look like a more woodsy Elrond, but that doesn't mean the toy isn't fun. The bonus weapons, in particular, suit the character well and make him stand out in the crowd.